Each year ArtTour International has the honor of choosing sixty top artists from around the world to be recognized as one of our Top 60 Masters. This award is a great way to gain exposure and bring your career to the next level! We're looking for artists that are inspiring, creative, and who stand out from the crowd. Sound like you? 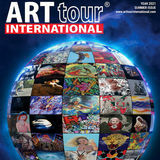 Â Send your submission today, If chosen, you will be featured in the Special Edition of ArtTour International Top 60 Masters issue, to be distributed at all Barnes & Noble Stores and over 1200 Newsstands Worldwide. This article will also be published on all of our digital platforms including iTunes, Magzter, and Kindle. Picture yourself receiving this prestigious award at the ceremony to be held at the AUDITORIUM AL DUOMO in Florence, Italy on May 23rd, 2020! Dream big, stay inspired! A Letter from our Editor-in-Chief Dear reader, Spring has sprung and here is a brand new issue celebrating the diversity of artistic expression and human creativity in a visually compelling package, brimming with vivid images as well as fantastic multimedia articles. I hope you enjoy our fascinating content. 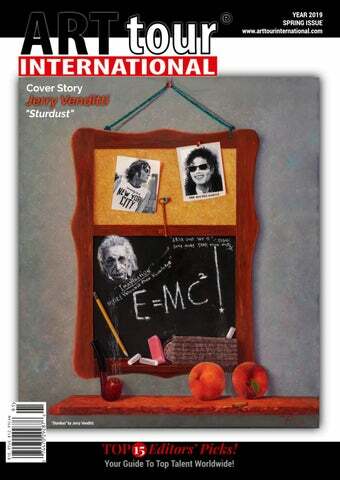 For this issue’s cover story “Stardust” we bring you an article full of mesmerizing images featuring exclusive works by American artist Jerry Venditti. American painter and social activist Jerry Venditti is recognized for his meticulous technique embodied in his personalized spiritual endeavor and profound message to take care of our planet, and those inhabiting it. We also bring you an exciting section on the top emerging artists to keep your eyes on – it's an incredible selection of top 15 international artists. Exciting news! The date for the ATIM's Masters Awards Ceremony is almost here, the biggest event for the year at ArtTour International Magazine when we celebrate and honor the artists that have been part of our publications during the past year. On May 27th, our team will gather from all corners of the world with over sixty master artists who will travel to the Museum Of Art and Design in New York for this grand celebration. Stay tuned to ATIMTV.com for news on the awarded artists of 2019. The ceremony will be broadcast live on the ATIM Facebook page and Livestream. We are proud to reveal that April 26th is the date for the launch of our ATIM’s Top 60 Masters 2019. This sought-after, much- anticipated catalog, amasses sixty modern artists and provides art reviews and compelling images of their works. It will be available at all Barnes & Noble Stores and our independent stores and newsstands on May 15th. For digital readers, the online issue of Spring 2019, available on iTunes, Kindle, and Magzter, provides the opportunity to click on the breathtaking images accompanying each article and be redirected to the accompanying video. Yes, it's a fantastic time for us here at ATIM: the collaborations, the endeavors, the anticipation of the future and what's to come. We're glad you're here to share the journey with us! Viviana Puello Editor-in-Chief ArtTour International Publications, Inc.
"Stardust" Oil On Canvas, 34"X30"
viewer with his artistic visual representation of his works while playing with significant themes of environmental conservation, the loss of innocence, morality, and peace awareness. What feels precious becomes a cultural exploration, inspiring the audience to rethink their relationship to the subjects of his paintings. "Fox" Oil On Canvas, 22"X16"
"Kestrel Hawk" Oil On Canvas, 16"X12"
"Pollinator" Oil On Canvas, 14"X12"
"Entrenched" Oil On Canvas, 16"X24" By Jerry Venditti A Signed, Numbered, Limited Edition Df 25 Giclée Prints Will Be Available For Sale. Jayce Venditti, the founder of AFOC, a Face of Change, is writing, producing, directing and acting in a film about the effects of PTSD. AFOC, in collaboration with Cammies & Canines (CAC), another nonprofit organization, is launching a fundraiser on April 27th, in San Diego, CA, to help win the war against Veteran PTSD and homelessness. "Heroes" Oil On Canvas, 20"X18" A Signed, Numbered, Limited Edition Df 25 Giclée Prints Will Be Available For Sale. “Everyday Angels” Oil On Canvas,24"X20"
“American Medieval” Oil On Wood, 16"X20"
collective vision. I don’t think it is possible to reflect on my generation of artists without considering that. Motherhood and teaching have been huge. My students, youth who have experienced more than they should have in their short lives, mature women fleeing unsatisfying lives, people caught off guard by conditions such as head injuries, were in need of significant mentoring as they faced their studies. Our experiences together affect my subject, material, platform, size and color and promote a sustaining positive philosophy. Today’s radical conservatism has hit very close to home, as my eldest, adult child is transgender. She has undergone unnecessary trauma as the socio-political climate has become increasingly contentious. I’m painting, through empathy, edgy, figurative work as she strives to adjust her life. Nature is my bliss so depiction of people indicates my anxiety level. Finally, the places I have lived have marked me. Their visual aspects very much infuse my emotions and memories appearing unexpectedly on my canvas.‘' Barrows-Young is a true creative visionary who firmly believes in the remarkable power of visual imagery, inspiring her audience to form a deeper connection with their environment. www.alisonbarrowsyoung.com “Endangered Species” Oil On Canvas, 24”X30"
olish native Anna Socha VanMatre is a dominant figure in the highest definition of fine arts, multi-layered photography, and synthetic threedimensional paper paintings, genuinely larger-than-life. She exhibits unique drawing strokes, with multi-panel and interchangeable starting points. Her philosophical lectures have also been a valuable addition to collaborative arts, as she brings metamorphism into life with an artistic language signature of her very own. VanMatre's most recent exhibition "To Those Who Warn...” was an epoch-making installation in the International Youth Centre in Oświęcim (Auschwitz), Poland. With a total length of 71 feet brought together in three parts made with graphite, pastel, and multi-layered photography, the artwork is dedicated to war hero Jan Karski, a member of the Polish underground movement who played a significant role in bringing to light the tragic events taking place in the Holocaust. VanMatre befriended him in his last years, and he became a source of inspiration for this composition. The first panel is a memorial journey created by her pixelperfect computer-enhanced crematorium fire images and pastel smoke effects of graphite, while the second part, with its silver-blue sky, stands in contrast representing a momentary glimpse of the outside world for those trapped in terror. The darkness of the third segment is a complete descent into despair. “Great Lion” Metal Sculpture, 33"X31.5"
“Thai Hanuman Makes Fun Of Bali Hanuman” (Detail) Metal Sculpture, 27"X22"
“Ganesha 16 Hands” Metal Sculpture, 29"X16"
“Thai Hanuman Makes Fun Of Bali Hanuman” Metal Sculpture, 27"X22"
"Vapor” Oil On Canvas, 60"X48"
rom lead fashion illustrator to fine art impressionist, contemporary artist Barbara Tyler Ahlfield has a temptingly expansive journey, drenched in drama and her fashion obsession. Influenced by history, lighting, antiques, and her turn-of-the-century home, she creates with a handpicked palette of oil colors, exhibiting the grandiosity of her subjects on large canvases. Tell us how this past year has been for you? What role would you say your art is taking in your life at this moment? "Pink Prowl” Oil On Canvas, 60"X48"
"Forsythia And Tulle" Oil On Canvas, 60"X48"
What is the most exciting aspect of your creative process for you? “The Essence of Beauty” was debuted in her solo show of 2018 at the Viviana Puello Gallery, in New York City. It featured the innate beauty and glamour of her signature style. Continuing to exhibit masterful skill and create intimate, and alluring work, Ahlfield has had a massive impact on the industry. Using various media, DeSerres models new and intriguing work using textures, transparencies and vibrant colors that elicit the mysteries of human emotion and narrates the surrealism of the images. “Soldiers” Sublimation Print On Aluminum With Acrylic Overlay, 36"X30"
oward Harris brilliantly combines technology and art to expand the viewer’s experience of photographic art. Working on dimensional photographic images, he displays his work on various layers of acrylic and metals. Harris' work traces to his skills in visual art, chaos theory, and quantum physics. He is creating a unique and impossible to repeat experience for every viewer. Harris' art involves a process of photographic construction where a single abstracted image is layered over itself on a clear acrylic surface before it’s superimposed on a grid. The bottom image is often reduced in size such that the whole piece creates a parallax effect. He then duplicates the parallax image in the viewer’s vision using negative and positive space. The result is a piece that shifts in space and changes color upon each movement the individual viewer makes. Given a distinct environment, viewing angle, hanging position and lighting situation; a rather static photograph becomes a dynamic moving image. “No Monkeys” Sublimation Print On Aluminum With Acrylic Overlay, 36"X30"
“Pages” Sublimation Print On Aluminum With Acrylic Overlay, 36"X30"
“Power” Sublimation Print On Aluminum With Acrylic Overlay, 30"X36"
“Oculus Maximus” Sublimation Print On Aluminum With Acrylic Overlay, 30"X30"
“Deep Blue Dream” Iron Painting, Mixed Media On Canvas And Wood, 67"X28"
interpreters of visual conceptualism. The most significant stages of the art world are hosting his works. Works that attract the bystander and lead him in those secret passages in which the intellect dialogs with his creative genius. Sculptures with dancing lines and rhythm given by the imagination of the artist. Artworks that do not belong to any known geometry and float in space. “Titel - The Other Side" Iron Painting” Mixed Media On Wood, 47"X31"
“Meeting In Karpathos” Mixed Media On Canvas, 20”X28"
“Amazing” Mixed Media On Canvas, 20"X28"
“Reach Karpathos” Mixed Media, Wood On Canvas, 20"X28"
“Sirens” Photograph, Hand Gilded With Palladium, Framed, 39"X30"
What places did you find yourself this last year that impacted your work? immigrants/refugees at a port. Initially, I thought they were Greek fishermen mending their nets. On asking if they minded, I realized only the captain was Greek. The crew were from Cairo, Argentina, and Africa. The continuing surge of people coming in daily by boats from outside the EU is creating problems, especially on the islands where, I am told, in some cases the numbers are now beginning to equal the original inhabitants. anice Alamanou’s fine art photography portrays a diverse collection of styles and the sensuous perception of the human form with the fleeting beauty of nature itself that only photographing over many years creating new, and different works can achieve. “Dryad - Yield” Photograph Direct Onto Aluminium, 31.5"X21"
“Human Nature - Evolve” Photograph On Aluminium, 31.5”X21"
“Poseidon's Child” Photograph On Aluminium, 40"X29.06"
“To Mopw (To-Morrow)” Photograph On Aluminium, 40"X29.06"
whether with illness or situations. So, let’s turn this around. To find a way. From the negative, create a positive - to restore balance in all areas. With this in mind, I create beautiful images of the environment, of people and amalgamations with subtle influences of issues that are, and will, affect us all. I hope people will see.'' Alamanou continues to be inspired, embodying debate, and tapping into ingenious new approaches to her art, delivering work that will play a role through time. She has released two books through Halstar Publishers, ‘From the Shoreline’ an award-winning book about Alamanou’s childhood and how it has affected her photography and the beautiful scenery of Norfolk, UK. The second book ‘Meandering Around Europe’ of her life living on Corfu and beautiful scenes of the many places she has visited and exhibited in throughout Europe. www.coastalphotography.co.uk “Red 2” Photograph, 31.5"X27.6"
ean-Jacques Porret’s surreal sculptures transcend the mere human form they represent, and instead draw the viewer in with their d e l i c a t e ex p r e s s i o n i s m , r hy t h m i c movement, and abstract sensuality. To categorize Jean-Jacques’ work as figurative or abstract is moot. Though figurative in practice, the work is never about the figure, but the emotions and ideas shared by the human race, expressed in the tension of his fluid curves and precarious balance. Though abstract in nature, the recognizable form and innate humanity residing within each piece is impossible to ignore. Thus, we are given a case study in restraint, with the artist utilizing the best aspects of each genre without clouding his final result, creating a self-styled harmony. a reflection of our collective and personal experiences, possibly changing in shape, but never in sensibility. “Discombulated” Mixed Media On Gallery Wrap Linen, 36”X36"
“Weeping In The Rain” Monotype With Embellishments On Lanaquarelle Paper, 6”X8"
nationally and internationally award-winning work has been represented in Germany, France, the Agora Gallery in Chelsea, New York City, Louisiana's State Museum. She is a printmaking instructor at Charleston, South Carolina’s REDUX Contemporary Arts Center. Katherine DuTremble’s work can be found in private and corporate collections in the US and Europe. The awards she has received reflect her versatility in her favorite mediums of oils and printmaking. “I’m Watching” Monotype With Embellishments On Lanaquarelle Paper, 6”X8"
“Amber In Magenta” Oil On Gallery Wrap Canvas, 40"X60"
She has most recently published an illustrated poetry book of forty poems and forty paintings entitled "Songs from My Heart" of which "Amber in Magenta" is the cover. Step into her world of color and light you are sure to have a memorable experience! Katherine accepts commissions through her private studio as well as through her website. “But She Said” Monotype With Embellishments On Lanaquarelle Paper, 6”X8"
“Carnac Sighs” Monotype With Embellishments On Lanaquarelle Paper, 6”X8"
“Trauma” Oil On Canvas + Objects, 33”X26"
erman painter Katrin Alvarez exhibits an exciting blend of expressionism and surrealism. Her striking often thought-provoking subjects, rendered in vivid colors and precise brush strokes, evoke dream imagery and defy natural interpretation. A raw voice in contemporary art, Alvarez' success roots to her methodical approach to painting, creating her surreal, oneiric and many times dystopic artworks that promote many conceptual themes focused mostly on social topics ranging from the overexposure to technology to the exertion of power unto others and especially the denouncement of child abuse. How do you feel, painting as vulnerable and open as you do? “For nearly 15 years I tried to make the most horrible crime a little bit more visible through my paintings: Child abuse. Probably I could make a few people think about “Abuse” Pencil On Board, 15"X19"
“Horus” Oil On Canvas + Object, 42"X50"
“In Good Hands” Oil On Canvas + Objects, 43"X46"
“Stupid Accident” Oil On Canvas + Object, 17"X21"
eminist advocate and intuitive artist Kimberly Berg highlights the feminine power and grace through a series of striking pastel images. He is using his figurative work as a tool to communicate his firm beliefs and journey in fighting for women's rights. In the mastery of his work, Berg depicts the luscious, benevolent, and liberated woman. His work honors the beauty and magnificence of the female figure and his interest in making women aware of their history have been successfully captured through his paintings. and her manipulation and contortion of color expertly explores nature’s spirit in its freedom and purity. Mague Brewer’s art is a call for rapid action and a reminder of nature’s peaceful pact with humanity. “Beautiful” Oil On Canvas With Mixed Media (3D Painting), 30"X30"
nnovative, and passionate, Michelle Larsen uses paper to create sculpted 3D canvases a technique she invented herself. Brimming with enthusiasm her work exhibits the fluidity of her thoughts and practice in using her breath as the guide for her creative direction, quite literally. When did you first begin creating dimensional works? What was your inspiration? “Van Gough Portrait” Oil On Canvas With Mixed Media (3D Painting), 24"X36"
“Man Of The North” Oil On Canvas With Mixed Media (3D Painting), 36”X48"
“Parrott Tulips” Oil On Canvas With Mixed Media (3D Painting), 36"X48"
“Einstein” Oil On Canvas With Mixed Media (3D Painting), 30"X30"
Her work is a vibrant tale of colors, that holds our hands in the experience of emotions and paths: a skilled, and highly intuitive creative mind delivering high quality work time after time. “Sunflowers” Oil On Canvas With Mixed Media (3D Painting), 36"X48"
“Morning Highlights” Colored Pencil, 11"X14"
ranquility and soft color hues are R.W. (Bud) Lichtenwalner's signature touch in his colored pencil architectural, and landscape works. He is originally from Nazareth, Pennsylvania and now lives in Bethlehem, Pennsylvania using his work as the narrative for his surroundings in nature. Lichtenwalner's work consists of detailed, realistic colored pencil drawings based on photographs, often taken on walks through the countryside. Using cross-hatching, individual lines, and shading, he meticulously records the details of the subject of his art. Each landscape captured by Lichtenwalner is intensely detailed with every object or element whether it is grass, stone or water conspicuously indicated and coherently arranged in the drawing to allow his audience to breathe in each life force. Detail takes place as the storyteller of each environment portrayed, exhibiting the different moments of both light and shadow created organically in nature. What positive influences have you witnessed your work evoke from your audience? ''Very much the same. Family and friends many times say that they can put themselves 'Right There' in the drawing, that it feels “Snow On The Fields” Colored Pencil, 11"X14"
“Henry's Woods In The Mornin” Black & White Pencil, 8.5"X11"
“Birdhouse On Trails Curve” Colored Pencil, Neocolor Ii, 11"X14"
so lifelike. I’m always encouraged to continue my work to expose many people to my art.'' Tell us a bit about your lifestyle and what influence it has on your work. ''My lifestyle is a rather relaxed affair, with traditional surroundings. I enjoy hiking on the trails at a local Environmental Center, enjoying the freedom of ‘getting away from it all’ and just immersing myself in the simplicity of nature.'' When did you start capturing nature through art? ''The first experience was in art class, both private and in the gifted program. In 7th–12th grade. That was the painting of a seascape with a palette knife and brushes. I won my first place award for art in the second grade.'' Lichtenwalner's passion and dedication to sharing moments with his audience continue to step his career into a successful journey. “Farm In The Dell” Colored Pencil, 11"X14"
“Fall Colors” Colored Pencil, 11”X14"
“Painting No. 4” Acrylic On Canvas, 48"X48"
y paintings combine fi g u ra t i ve a n d a b s t ra c t painting. I want it to be read like that. I require more effort and commitment from the viewer of my paintings - to pay attention not only to the composition, form, penetration of the planes of color, brightness and light. Light is reflected differently from a flat surface and different from a thick texture. Additional impressions are caused by transparent textures. I want my paintings to have a sensual and emotional effect, not necessarily because of the content but more because of the diversity of their surface. Penetration of textures, colors, and light - as in life - the permeation of feelings: love in sadness, sadness in reflection, reflection in expectation. An expectation for love. “Scent Of A Woman” Oil And Own Tech On Canvas, 55"X39"
“Woman And Unicorn” Oil And Own Tech On Canvas, 55"X39"
“Archetype Of A Woman” Oil And Own Tech On Canvas, 59”X39"
“Windows” Welded, Painted Steel, 99"X168"X96"
“Konnected” Welded, Painted Steel, 78"X 66"X56"
“Life & Soul” Oil & Acrylic On Canvas, 15.7"X31.5"
“The Feather” Oil & Acrylic On Canvas, 56.7"X66.9"
modern time that advances at a crazy pace. A race that goes on despite any obstacles. " “Girl Portrait” Oil & Acrylic On Canvas, 15.7"X15.7"
orthern Ca. Artist Eric Wiles Landscape and Fine Art photography reveal dynamic images of natural beauty and man-made objects. His contemporary approach has propelled his work to the exhibition at the Musée du Louvre and recently awarded Artist of the Year 2018.
www.ew-photo.com www.facebook.com/ Eric.Wiles.Photography/ @eric.wiles.photo twitter.com/ewilesphoto “Waimea Canyon” Photography, 24"X34"
“Azul Profundo” Acrylic On Canvas, 39"X39"
“El Mas Alta” Acrylic On Canvas, 31"X47"
“Tres Dimensiones” Acrylic On Canvas, 71”X39"
wa Zeller lives in New York and born in Poland in. Zeller works with oil, acrylic, pastel, and watercolor. Her painting style can be seen as a combination of realistic, and impressionist work. She paints natural subjects in a combination of representative styles, and her works have been presented in New Jersey, Pennsylvania, New York, and Connecticut. Her painting can also be found in numerous collections throughout the United States, in the Trenton City Museum, Princeton Academy of the Sacred Heart, and in the John Paul II Foundation in Rome. “Rebuilding Space, After A Game” Fumagine And Acrylic Paint And Dots, 15.7"X15.7"
“Rebuilding Space, After Damage” Fumagine And Acrylic Paint And Dots, 15.7"X15.7"
ne of the more unique contemporary artists to emerge on the scene, Belgian artist Frans Frengen has developed a work process that is as intriguing as the artwork he creates. Frengen studied painting and drawing under prominent artists for some years before developing the signature "Fumagine" technique that forms the basis for much of his work. “Rebuilding Space, After Abuse” Fumagine And Acrylic Paint And Dots, 15.7"X15.7"
“Colors Of My City" Collection New York, New York, Acrylic On Canvas, 30"X24"
"Are You Coming Tomorrow" Series Moods, Acrylic On Canvas, 30"X24"
“The Spirit” Acrylic And Oil On Canvas, 43.31”X19.69"
“La Vida” Acrylic And Ink On Watercolor Paper, 19.69"X25.59"
“Heavens Peace” Acrylic And Ink On Watercolor Paper, 19.69"X25.59"
orean artist Jeong-Ah Zhang majored in sculpture and painting at Ewha Woman's University in Seoul, Korea. Jeong-Ah Zhang's works take its basis in traditional philosophies and the pursuit of unchanging truths to express contemporary expression through proven materials and practice that reflect the phases of time. The artist finds a kind of order when looking at life, a moment when she realizes the truth, and also paradoxically, integration of all things visible and invisible. www.josephinepititto.com www.josephinepitittoart.com “Leaving” Ink On Watercolour Paper, 10”X10"
“Overstretched” Ink On Paper, 10"X10"
“Le Reve Des Miserables” Ink On Canvas, 40"X40"
“La Vie En Rose” Acrylic On Canvas, 25.6"X36"
“Fleur De Mer” Acrylic On Canvas, 28.7"X39.4"
“Ardoise Épicée” Acrylic On Canvas, 25.6"X36"
successfully worked as an international artist for nearly thirty-five years , born June 9, 1941, in Switzerland, where she has her atelier. “Strange Night” Acrylics On Card, 11"X16"
“Hope Of A New Dawn” Acrylics On Card, 11"X16"
www.maribelmatthews.com “Days & Nights Of Suns & Stars” Acrylics On Card, 11"X16"
“Appalachia” Oil On Linen, 35”X60"
the art. To Matt, art is always a constant recording of a mood, feeling, or culture captured in time forever. He is always grateful to be part of this contemporary journey in the arts. “Mirror Lake” Acrylic/Mixed Media On Canvas, 30”X40"
“Blue Season” Acrylic/Mixed Media On Wood Panel, 12”X12"
cott Weingarten born and raised in Brooklyn, New York USA. Attended Art College for four years in New York City. www.scottweingartenphotography.com “Beguiled” Fine Art Photography, 22"X28"
“Her Mystery” Fine Art Photography, 22"X28"
“Peacock” Fine Art Photography, 22"X28"
“Fiorone” Oil On Canvas, 25.5”36"
irkka Laakkonen is a Finnish painter who studied art at NAFA Singapore, School of Sacred Arts New York, and Free Art School in Finland. She practiced classical Chinese brush painting, color harmony, and portrait painting. Laakkonen likes to paints people, nature, and cityscapes, with oil on canvas using powerful colors emphasizing light and shadow. -Solo, joined and group exhibitions. -Biennales. Firenze 2011, Milan 2017, Venice 2017 -Art Shopping; Brazil, Canada, China, England, Finland, France, Germany, Italy, Russia, Singapore, Spain, Sweden, USA. “Surprise” Acrylic On Canvas, 31.5"X31.5"
aster artist Siegfried Lehman is ever evolving in the stages of his work, taking advantage of the many resources that surround him in his creative process. Using abstract interpretation when painting with oils and acrylics, graphics and 3d installments to communicate his message with his audience. Lehman has a curious spirit with his work, expressing his thoughts about consciousness as well as his likeness for technology and recent advances. His environment is his tool for expansion in his work, always reinventing himself and moving forward as quickly as the world around him. “The Forrest Of Today” Acrylic On Wood With 3D-Elements, 27.6"X39.4"
“Nora With Spring” Oil On Canvas, 27.6"X39.4"
“Inspiration In Red” Oil On Canvas, 27.6"X39.4"
“Entrance Into The Wonderworld” Acrylic On Wood With 3D-Elements, 27.6"X39.4"
orn in North India, and now residing in California, Award-winning artist Subodh Maheshwari brings together cultures through her diversified symbolic artistry. Her vibrant compositions are emotionally evocative, personal, spiritual and profound, exhibiting the ethereal beauty of nature, emotional turbulence, changing political scenario, global warming, women's rights, social turmoil or a wholesome spiritual theme. This Aligarh born expressionist continues to capture the timeless vivacity of the world in its dramatic transition between love and its void with skillful use of oil, gouache, watercolor, acrylic, and mixed media on paper. Subodh Maheshwari finds her inspiration in nature and transforms her personal life experiences into masterful artworks rich with symbolism, color, movement, and form. Her paintings tell a story that shifts according to the viewer's perception. “Past, Present, And Future Tense” Gouache On Paper, 22"X30"
patterns, and opaque pigments. "Liberty" and the "Symbolic" series cannot escape the discerning eyes. While some of her themes seem to reflect her admiration for the Mughal and Rajasthani art, the others stem from her strong emphasis on Hindi and Sanskrit passages. Marrying Eastern and Western experiences into her vibrant composition style and delicate color technique, her audience is given the opportunity to experience Maheshwari's emotional, personal, humorous and spiritual upheaval. Subodh Maheshwari studied fine art at Agra University in India and earned her Masters at the University of California. She also teaches art at the local community college and conducts workshops for aspiring artists. “Untitled” Mixed Media On Canvas, 24”X36"
“The Pond At Sunrise” Acrylic On Canvas, 30”X40"
“Reflections At Sunrise” Acrylic On Canvas, 24”X36"
Held on December 7th, 2018 paving the way for international artists "Made In Quebec" was held at the Viviana Puello Gallery, which showcased a collection of French Canadian artists by Le HangArt. he exhibition, organized in New York City to give international exposure to emerging talents, offered the public with an opportunity to explore messages brilliantly expressed through the power of imagery and be inspired with a wonderful selection of stunning paintings by sixteen Canadian artists.